Birmingham may not have the white-sugar sand beaches that attract millions of visitors each year to Alabama, but it does have rich history, nationally ranked dining, world class museums and genuine southern hospitality that is helping it gain international notoriety as a travel destination. The Alabama Tourism Department’s Economic Impact Alabama Travel Industry 2015 conducted by Smith Travel Research reveals that Alabama had more than 25 million visitors in 2015 that spent nearly $12.8 billion in the state. Beaches were the state’s top attractions in 2015, accounting for nearly 28 percent of the state’s tourism impact, but the Magic City came in second and accounted for a close 20 percent. In 2015, more than $2.5 billion in travel-related expenditures were injected into metropolitan Birmingham’s economy, employing nearly 36,000 in travel related occupations. 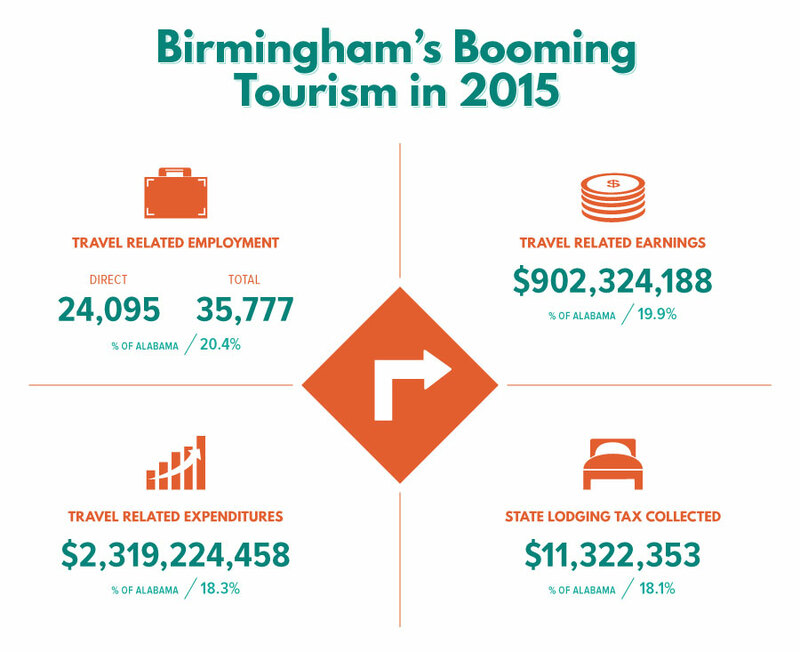 Recent accolades touting Birmingham illustrate a strong tourism industry. Just within the past year, Birmingham has been recognized by the Travel Channel as one of 11 next great destinations; Lonely Planet recently recognized Birmingham among the top five best places to visit in 2016 and Forbes ranked Birmingham among the 20 best destinations in Canada, Mexico, the U.S. and Caribbean for travel this summer. Accolades singing the praises of the Magic City have skyrocketed over the past year. So far in 2016, Birmingham has received more than two dozen accolades from national media, up from 21 accolades for all of 2015. Other recent accolades shaping Birmingham’s tourism industry includes Regions Field being named by Baseball Park Digest as the No. 1 baseball park in America for 2015 and the finalist for 2016, Highlands Bar and Grill was named as the best restaurant in Alabama by Business Insider, and Zagat named Birmingham the No. 1 Next Hot Food City in America. And according to Nielson, metropolitan Birmingham leads the nation in craft beer sales, which is a reflection of the new breweries that have popped up in and around downtown over the past few years. The momentum from Birmingham’s national recognition is being felt along the city streets. With more than $1 billion in construction activity, many significant historical structures are being preserved in downtown Birmingham to serve residential, retail and commercial needs. The city has created places that people want to experience, such as Railroad Park, Rotary Trail, Zyp Bikeshare and renowned Civil Rights District, that provide an impetus for hospitality-related development such as restaurants, breweries and hotels. As a result, more than 1,000 hotel rooms have either recently opened or are under construction in downtown Birmingham, and according to Southern Living, Birmingham had five of the eight Alabama bars ranked among the top 100 best bars in the South. Metropolitan Birmingham has three of the state’s top five admission-charged attractions: No. 2 Robert Trent Jones Golf Trail (580,221 visitors); No. 3 Birmingham Zoo (576,974 visitors); and No. 5 McWane Science Center (367,995 visitors). Attendance at McWane Science Center increased 11 percent between 2014 and 2015 – the second largest attendance increase among Alabama’s admission charged attractions. Metropolitan Birmingham has three of the state’s top five free attractions: No. 1 Birmingham Botanical Gardens (350,000 visitors); No. 4 Birmingham Museum of Art (132,000 visitors);and No. 5 Sloss Furnaces National Historic Landmark (94,382 visitors). Birmingham’s National Veteran’s Day Parade ranks as the state’s seventh largest attended festival, with 100,000 attendees in 2015. Metropolitan Birmingham has three of the state’s top 10 most visited parks and natural destinations: No. 4 Oak Mountain State Park (555,000 visitors); No. 5 Railroad Park (548,000 visitors); and No. 6 Tannehill Ironworks Historical State Park (540,000 visitors). Oak Mountain State Park experienced a 52 percent attendance increase between 2014 and 2015 – the highest among the state’s major parks and natural destinations. Metropolitan Birmingham has three of the state’s top 10 sports destinations: No. 3 Birmingham Barons Baseball (444,639 attendees); No. 6 Barber Vintage Motorsports Park (170,735 attendees); and No. 7 SEC Baseball Tournament (120,386 attendees).